According to The United States Department of Justice, cybercrime and cyberattack is one of the greatest threats facing our country and has enormous implications for our national security, economic prosperity and public safety. While companies of all sizes across the globe are at serious risk of having their vital financial, employee and customer data hacked, small- to medium-sized businesses are often targeted because their defenses aren’t as strong as those of larger businesses. And cybercrime continues to grow at an increasingly dangerous rate—a 27.4 percent year-over-year increase. Yet only 25 percent of organizations have a formal cyber incident response plan, and many underestimate the capabilities of cyber criminals. In fact, it’s estimated that only 1 of every 100 security compromises is even detected. In 2016 alone, 64 billion data records were stolen. So, how do organizations lose so much money when they fall victim to a cyberattack? Business disruptions are the largest cost component of a cyberattack at 39 percent. Organizations require a more comprehensive, sophisticated, proactive and affordable solution than what’s currently being used. 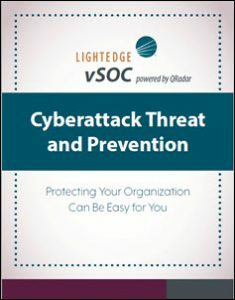 To learn more about how to make protecting your organization from cyberattack threat easier, download the new white paper, courtesy of LightEdge Solutions.